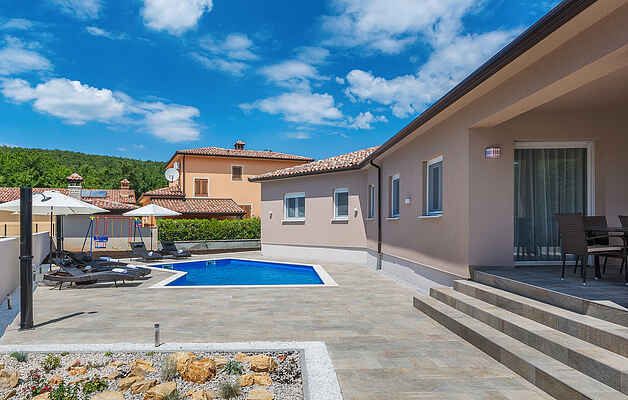 This beautiful holiday home is located in the small village of Marceljani, near two interesting points of Istrian tourism - Labin, a picturesque town on a hill, and Rabac, a tourist resort with the most beautiful beaches in Istria. It has three bedrooms, three bathrooms, toilet, kitchen with dining area and living room and a covered terrace where you will surely enjoy the summer evenings. The outdoor pool provides refreshment on hot summer days. Also visit one of the events that take place during the summer months in Labin. We also recommend day trips to other Istrian destinations such as Pula, Brijuni National Park and Rovinj.